Joel Stidley, MCSE, MCTS, is a Microsoft Exchange MVP with over 12 years of IT experience. Currently, he is a Solutions Architect at Terremark Worldwide, Inc. 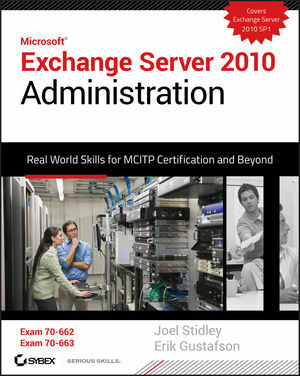 He is the founding member of ExchangeExchange.com, the author of MCTS: Microsoft Exchange Server 2007 Configuration Study Guide, Second Edition (Exam 70-236), and coauthor of Professional Windows PowerShell for Exchange Server 2007 SP1. Erik Gustafson, MCSE, MCSA, has over nine years of IT consulting experience and is currently a Solutions Architect for Terremark Worldwide, Inc. A contributing author to MCTS: Windows Server 2008 Applications Infrastructure Configuration Study Guide, he is also a content provider for uCertify.com. The last sentence on page 110 should read: ?In step 3 in Figure 3.21, Outlook connects to the database that contains the user?s mailbox using a local Client Access Server.? ?The Client Access server that hosts Autodiscover will be queried in step 3 and return the information needed to configure Outlook. In step 4 Outlook uses the configuration information to connect to the correct client access server and ultimately the Mailbox Server hosting the users mailbox.? In the last line of code in the listing on pages 181 and 182, a space has been omitted between ResourcePropertySchema and $ResourceConfiguration.ResourcePropertySchema.